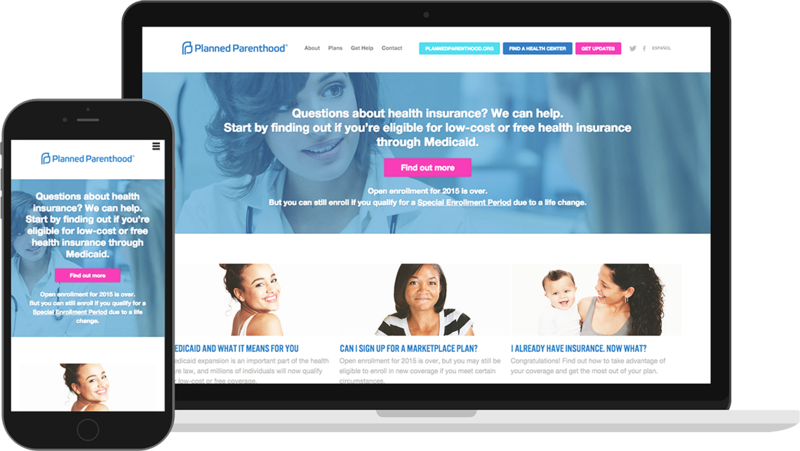 Planned Parenthood hired 270 Strategies to develop an outreach campaign to educate eligible, uninsured women about what the Affordable Care Act means for them — and how to get covered. We needed to provide resources in an easily digestible (and shareable!) way — including how to get financial help, find insurance plans that include Planned Parenthood, and know what questions to ask when enrolling. To do that, we executed an integrated digital strategy — including a brand-new Health Insurance Facts website as well as email, SMS, and social media programs. We developed a microsite in both English and Spanish that allows women to compare health plans that work for their budget, schedule appointments for in-person help with enrollment, calculate how much insurance would cost for them, and even find health centers and make doctor’s appointments. We continually tested and optimized the site to maximize its impact to reach the most people. In partnership with PPFA, we also launched the first-ever consumer facing email program for the organization, executed an English/Spanish SMS program, and developed a coordinated social media strategy across existing PPFA properties. To date, 11.7 million Americans have enrolled in a health insurance plan through the marketplace. From the start of our work in October 2013 to the end of the second open enrollment period in February 2015, we had grown the email list from zero to nearly 100,000 people, and more than 1.2 million individuals have used the new website to learn about the Affordable Care Act.